EDIT (For users of Recording Service): With the release of Recording Service 1.33 it is now possible to see the DVBViewer Favourite List (the local one) directly in the web interface. This makes the result of this tutorial a bit confusing. Suggestion: Use another name for the Favorites Root (eg. Preferred, MyChannels,...). If you have allready followed the tutorial it is easy to rename the Favorites root. It still makes sence to have one or more roots at the beginning of the channel list containing channels someone actually watches. Each DVBViewer client can then have its own DVBViewer favourites. This is a new channel scan. It has been opened just by clicking ”Open DVBViewer”, then ”Save As...” YouSeeOrg.dat. Not the best scan ever seen due to the Unknown categories. 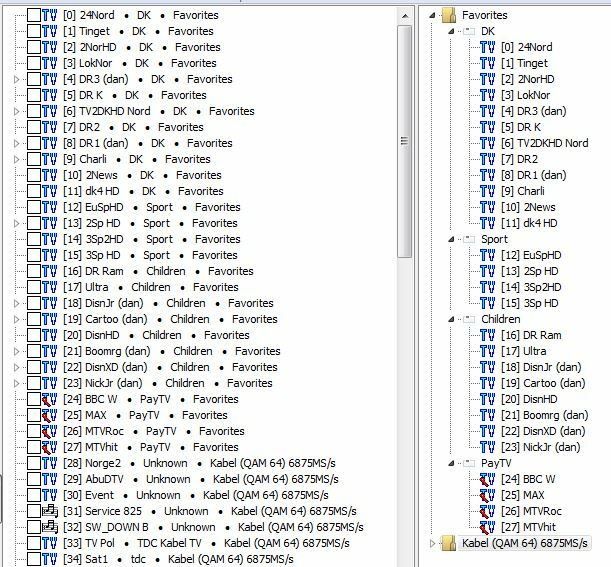 Left pane is an image of the channels as stored in the DVBViewer channel list (channels.dat). This is the working area where we are going to rearrange and delete channels. As you can see the channel number is just the position in the channel list. 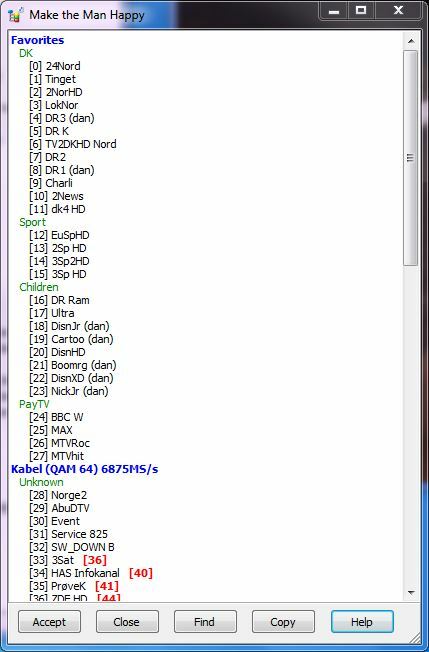 The right pane is the structure, the channel list as it could look in DVBViewer, except subchannels are not shown and there is no distinction between TV and radio. There is not much functionallity here, it's a preview. The man (lower left corner) does not look happy because the Unknown categories violates the structure: channels are not properly ordered in the structure preview. For now we don't care: we would propably make him unhappy right away anyway. Our goal is to create a new root (Favorites) at the beginning of the channel list containing categories DK, Sport, Children and PayTV. We shal assume we have a subscription to channels World, BBC W, MTVRoc, MTVhit. 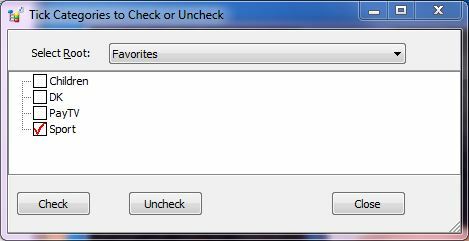 Just use F12 to uncheck. When you are finished, close the search window and click ”Delete checked” or hit Crtl+Del. They are not really deleted: Select Edit → Restore Deleted... if you want to delete them or some of them permanently. 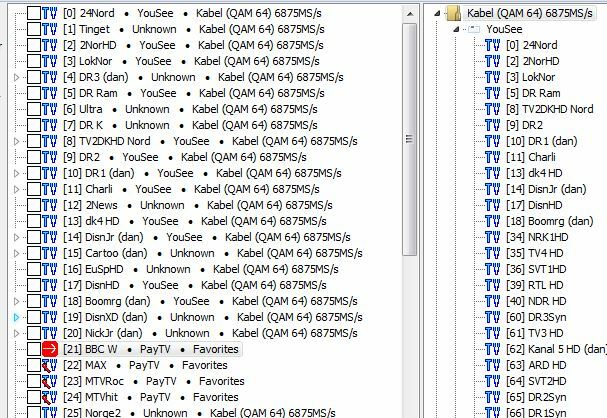 In general deleted channels are stored in a companion file with extension .Xdel. In essence this technique describes the idea behind XchannelEdit: it's all about getting your favorite channels checked, move them to top, then rename categories and roots. There are several checking and navigation methods (By Categories, Search, Bookmarks, GoTo). 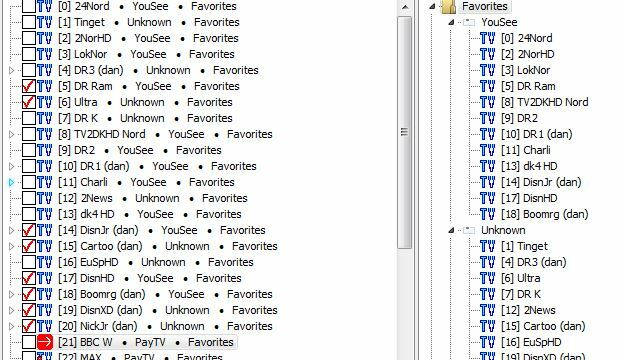 If the channel list is not too huge a simple way is to go through it one page at a time, check the channels you want to delete and then delete them (Ctrl+Del), check your favorites and then move them to top (Ctrl+T). In that case uncheck With Checked do → Keep Moved Channels Checked (Important!). 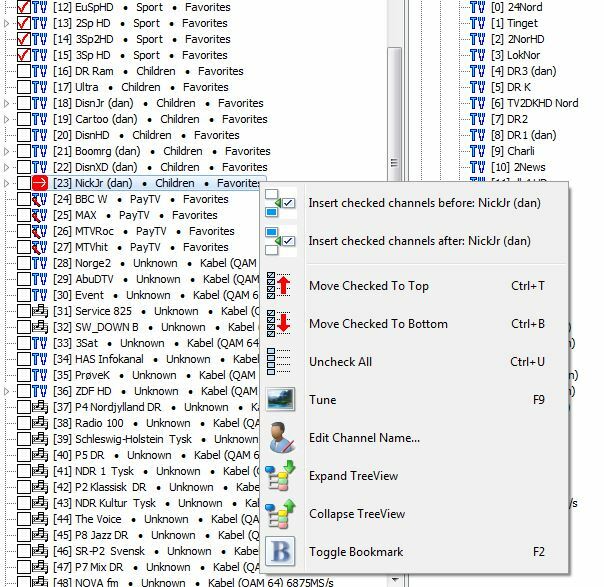 NOTE: Using Shift+Up/Down you can multi check (or uncheck) channels in as many sessions as you want. There is a price to pay for the latter: if you accidencally go too far and want to go in the opposite direction you have to release the Shift key, go one step in the opposite direction, then press the Shift key again. Use SPACE to check/uncheck a single channel. Left to be done is reordering channels within categories and selecting the prefered audio track. It can be done within XchannelEdit (see later), but maybe you want to do that within DVBViewer when the time comes. Click Help for details. Click Accept: The red (illegal) channel numbers disappear and indeed, the man becomes happy! 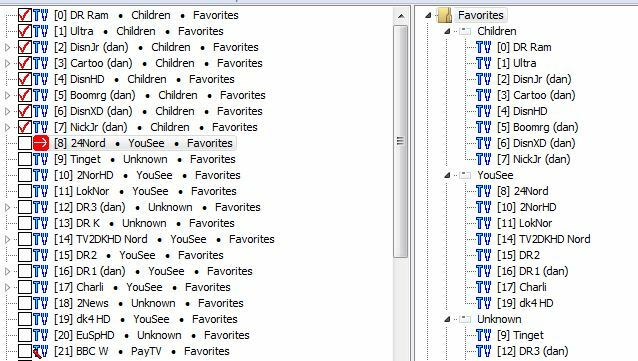 To save the channel list for use in DVBViewer (and Recording Service) you need to close DVBViewer (and stop Recording Service), just to be sure that everything is in sync. If you store your channels.dat in a windows system folder you need to run XchannelEdit as administrator (you should then ofcourse first save the channels ”Save/Save As” before you exit XchannelEdit). The easiest way is to expand the treeview (popup menu: right click or use Shift+F10) go to top (HOME) and then use arrow down key to locate a subchannel. Hit F11 to make it the default audio track (NOTE: DVBViewer uses F10, not possible here). You can drag and drop a subchannel as well. NOTE: The dragged channel is always inserted before the target (drop to) channel. By default (Options → Settings...) only drag and drop within the same category and root is allowed since crossing such a boundary would make the man unhappy and you would then have to manually rename category and/or root to make him happy again. In DVBViewer the category/root is automatically renamed if you do that. 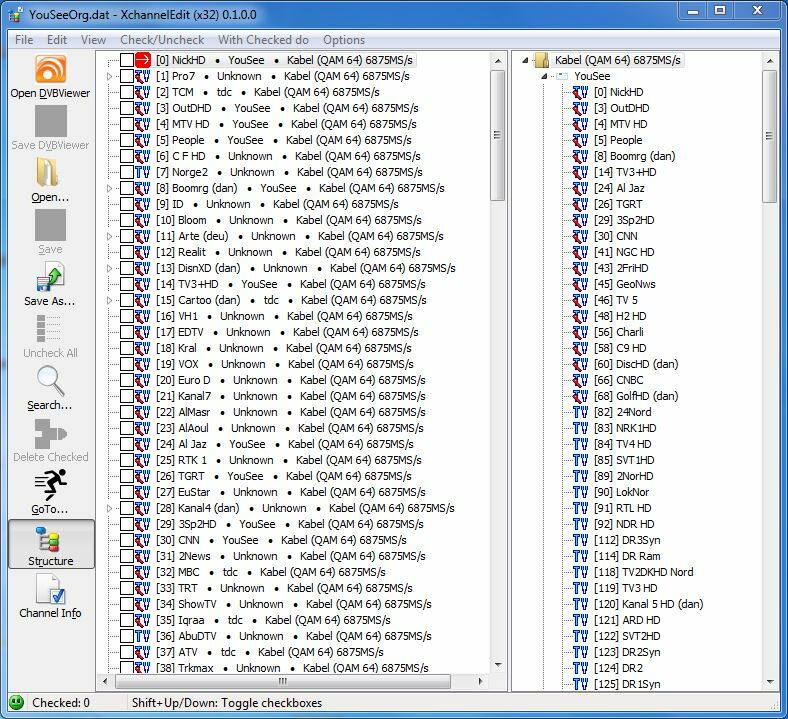 Furthermore, with DVBViewer version 5.6+ multiselection at the same level combined with drag/clip/copy/paste is available. You should then ofcourse select ”Insert checked channels after: NickJr (dan)" to accomplish the task. When you have selected preferred audio tracks and rearranged channels it is now easy in DVBViewer to create Favorites. Simply drag and drop whole categories to the DVBViewer favorite pane. The Favorite channel numbers will then be the same as the channel numbers. In Recording Service it is now easy to access the favorites since they are simply the first root.